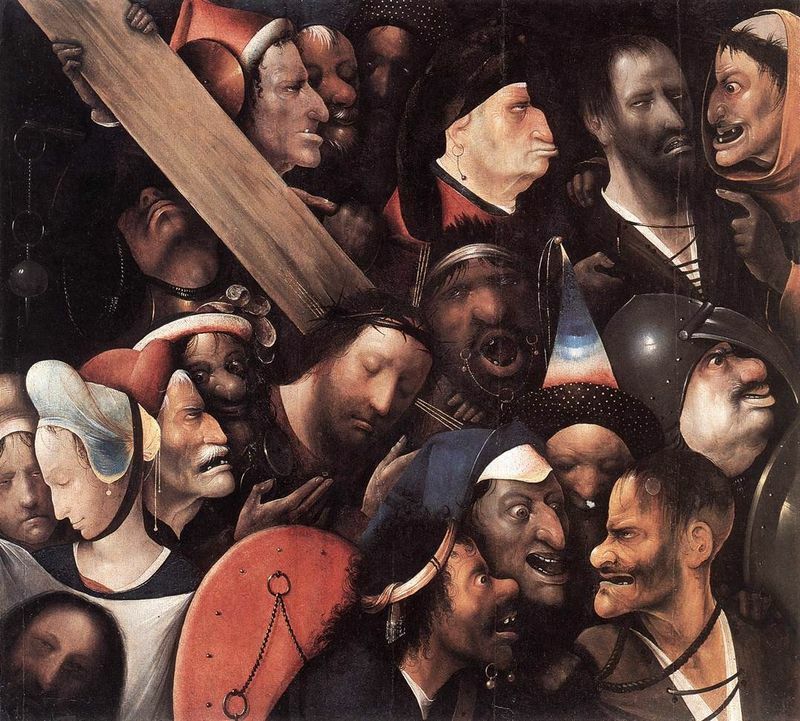 Hieronymus Bosch created many paintings featuring saints throughout his career and for him they were spiritual heroes who maintained their faith despite suffering physical and mental torment. The artist's favorite saint was Anthony and he immortalized him in this triptych, which includes the main themes of Bosch's art - sin and folly, Hell, the suffering Christ and the unrelenting faith of the saints. 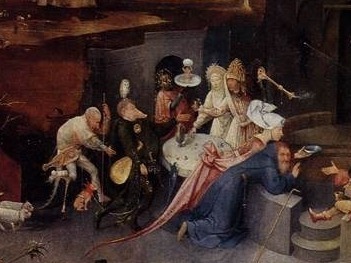 Bosch relies heavily on symbolism in this work; on the right panel, Anthony tries to look at the viewer, but his attention is drawn to a table surrounded with creatures partaking in sin. The center panel is quite different and focuses on the saintly ability to refuse temptation and the power of devotion to Christ, an optimistic theme that Bosch enjoyed painting. At the time this work was created temptation also meant physical and/or mental attack by demons. Therefore in The Temptation of St Anthony, the subject is not only tempted by the pleasures of the flesh but also tormented by the demons. Yet, St Anthony is victorious in overcoming such tests and this is emulated by other solitary saints and the Passion of Christ, who is represented on the outer panels of the work carrying of the cross. Bosch's earlier depictions of Christ were more positive but he became preoccupied with sinful behavior and often loaded his works with anxiety and feelings of guilt. Neverthless, The Temptation of St Anthony is a hopeful triptych, and, at a time when people believed in the certainty of Satan and Hell, the tolerance and determination of Anthony must surely have offered reassurance to its spectators. Despite the fact that Bosch's career thrived during the High Renaissance, the area in which he lived was very much dominated by the beliefs of the medieval Church. Thus, when creating The Temptation of St Anthony, he was inspired by the medieval imagination, as well as the fiends of cathedral ornaments and illustrations in books and popular prints. 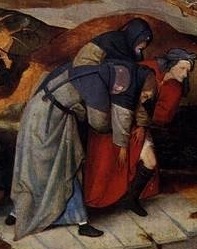 The theme of St Anthony being tempted has featured in both art and literature for centuries, with different depictions of Anthony's trials during his stay in the Egyptian desert. This topic was first discussed by one of Anthony's contemporaries, Athanasius of Alexandria, and later became famous in Western culture. The earliest artworks featuring this theme were 10th century Italian frescoes. It then appeared in books during the later European Middle Ages and later in German woodcuts. 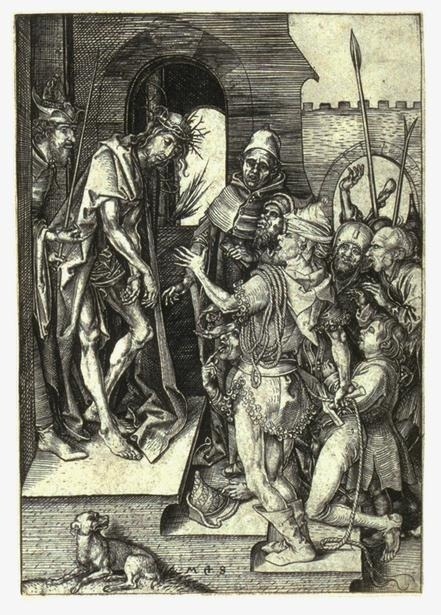 Examples that may have inspired Bosch include that by Martin Schöngauer, a German artist and engraver. More recently, Saint Anthony has featured in the works of Salvador Dalí and French author Gustave Flaubert, who regarded his 1874 book The Temptation of St Anthony as his greatest work. 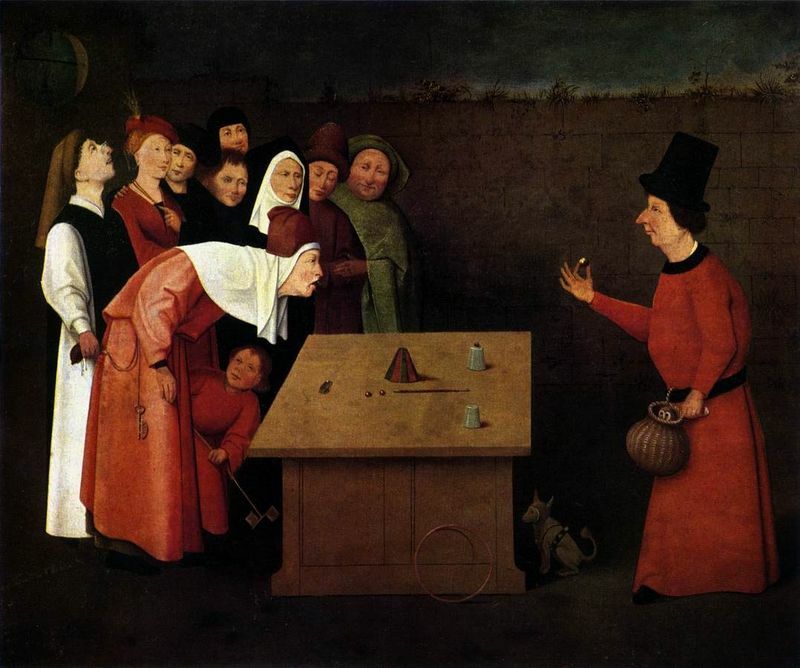 Many of the paintings Bosch produced are similar to the works created by the Surrealists, like Dali, centuries later. They too paint a world based on fantasy and therefore Bosch's works are strangely modern and his popularity among current artists and art fans has been strong. The Temptation of St Anthony depicts his trials in different stages; the first panel illustrates his flight and failure, the middle panel shows him being tempted, and the last section focuses on the saint in meditation. This triptych perfectly demonstrates Bosch's stylistic maturity with its fluid composition and subtle lines and movement. Saint Anthony is a heroic representation of man faced with various ugly demons with bodies made from vegetables, animal, human and lifeless parts. Such monstrous creatures typify Bosch's artworks and The Temptation of St Anthony is his greatest example of the consequences faced by sinners in the depths of Hell. The background landscape is conveyed with acute detail which adds to the terrifying tone of this work and enforces the reality of Hell awaiting those who have deviated from God and all that is good. The artist's portrayal of man's struggle against temptation and the omnipresence of the Devil is one of the best examples of his personal iconography. Unlike in his previous paintings, Bosch has great command over his brush stroke, adding sharpness to the image. 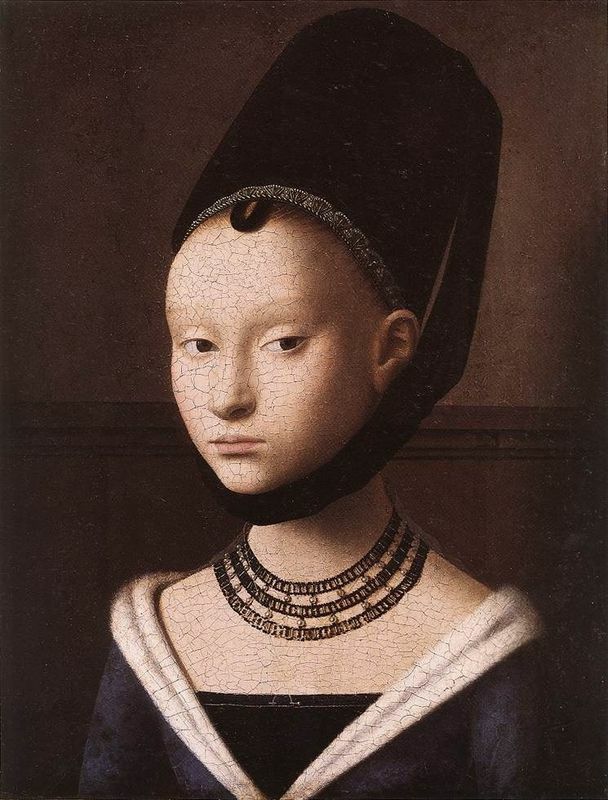 The lasting beauty and quality of Bosch's work is mainly down to his vivid tones and brilliant technique, which was much smoother than that of the majority of his peers. Space is controlled by the episodes and creatures that the viewer's attention is focused on. 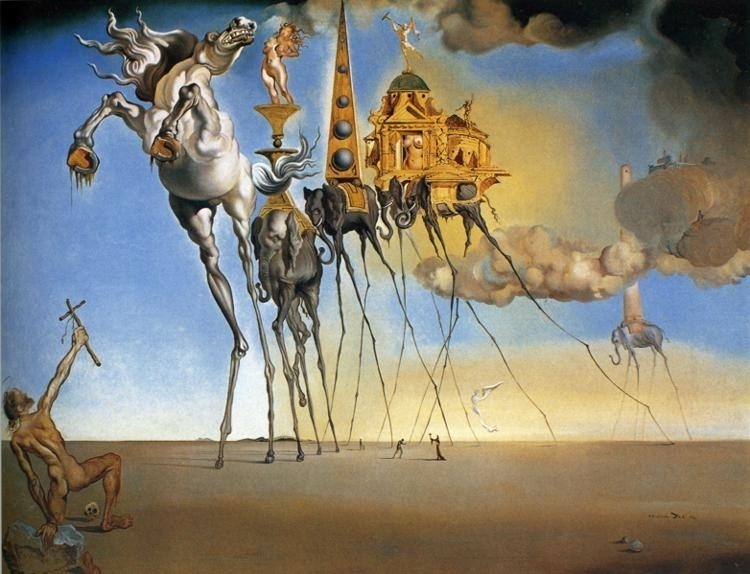 Dalí's version shows Saint Anthony resisting temptations associated with a spider-legged horse and elephants. The "space elephants," reminiscent of Bernini's's elephant and obelisk, are a theme in Dalí's work. 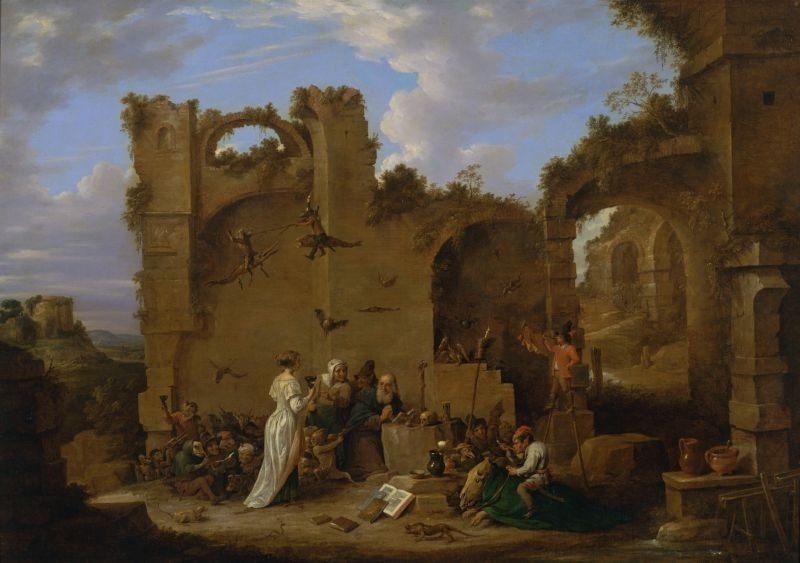 A fellow Flemish painter, David Teniers the Younger referred to Bosch as an inspiration for works such as this. The Temptation of St Anthony is displayed at the Museu Nacional de Arte Antiga in Lisbon, Portugal. Hieronymus Bosch used stunning imagery to depict moral and religious ideas and stories, and he set himself apart from his contemporaries with the disturbing detail of his panel pictures. During his career he repeatedly painted saints in distinct landscapes, encountering evil and grotesque devils. Yet, it is in The Temptation of St Anthony that Bosch best portrays the vivid and circumstantial changes of spiritual life, clearly and with great attention to detail. 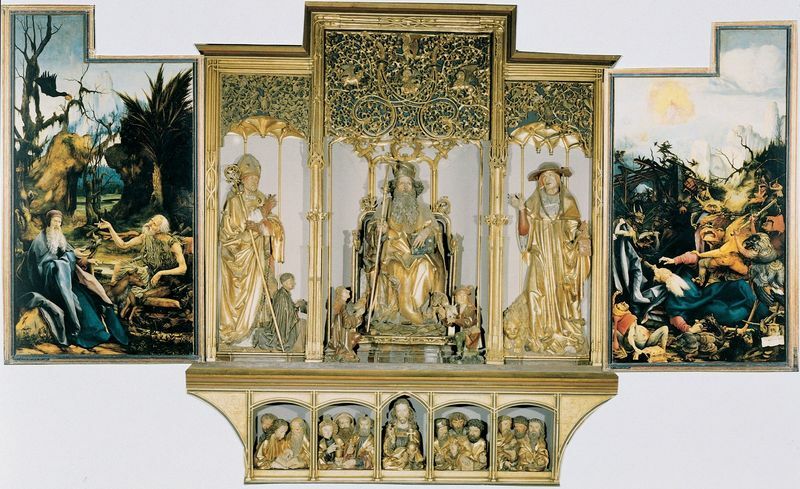 Produced in the middle stages of his career, triptychs like this were highly ambitious projects to undertake and Bosch successfully merges elements of fantasy and chaos with pleasant scenes of mankind in the age of innocence. 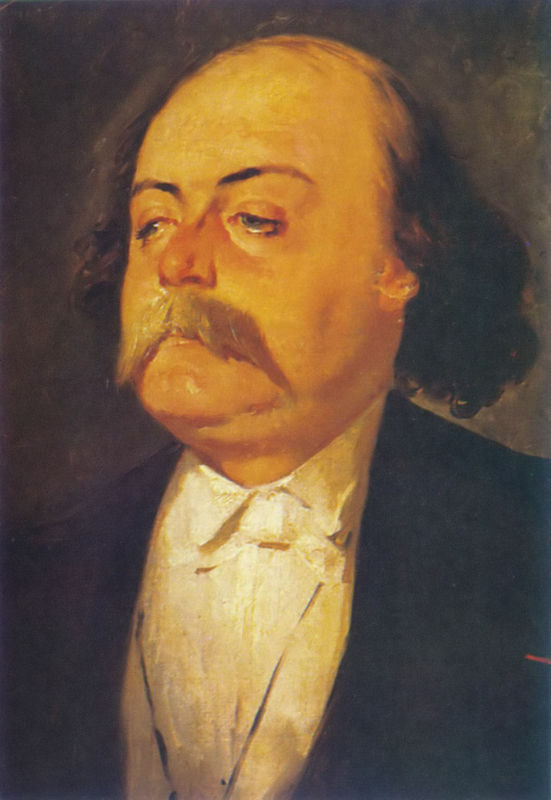 Such works were evidence of his developing thought processes and the evolution of his earlier works. Relying heavily on symbolism and working freely, many of Bosch's paintings focused on the torments of Hell and his later works in particular were highly original and sometimes offered a literal translation of verbal metaphors set out in the Bible. Both wonderful and terrifying, his works were unforgettably garish and his technique remains unmatched to this day.